Battery life differs greatly when you compare different mobile devices running Android. From devices that drain battery quickly to devices that seemingly can run for days without recharging. Many factors play a role when it comes to battery life: there is the battery itself, the device's hardware and screen, settings such as the display brightness, and also applications that run on the device in the background. Tip: applications like Battery Aid may help improve battery on Android devices. What the device does or does not do when connected to a wireless network may play a role as well. Some Android devices are configured to keep mobile data on while on Wi-Fi while others are not. While keeping mobile data enabled has advantages and may even be required for some functionality, it may also drain battery quickly. 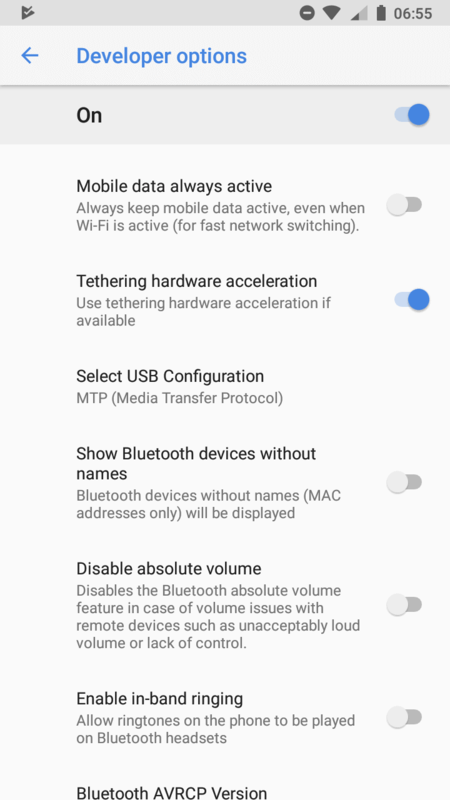 If your Android device gets less screen time before you need to charge its battery than it should, you may want to check the following setting in the Developer Options of the device. Note that there are hundreds of possible reasons why you need to charge the phone frequently; this is just one of the factors that may play a role if it is enabled. Open the Settings on the Android device. Scroll down to System and activate it. If you see "Developer options" skip the next two steps. Tap repeatedly on build number until you see the "You are now a developer" notification. Tap on Developer options under Settings > System. Scroll down to "Mobile data always active" and make sure the setting is turned off. If it is on, toggle it to turn it off. Attention: Some features on the device may require the functionality to function properly or at all. You will notice that MMS sending won't work if mobile data is not active, and T-Mobile customers may not be able to use Wi-Fi calling anymore. Basically, what you want to do is test if turning the feature off impacts functionality. Turning off the feature benefits users who noticed that their device's battery life is not as good as advertised. There are plenty of reasons why that may be the case, but if you are connected to Wi-Fi networks usually, you may want to check the setting to find out if the device keeps mobile data connections alive as well at that time. Some Android devices are configured to keep mobile data on while on Wi-Fi while others are not, and that may impact battery life significantly. Using a black wallpaper, setting some apps to never run in the background, disable auto adjust screen brightness and manually set a low brightness. Disable location and mobile data when at home. These are some of the tweaks which results in better battery performance. They work for me, ymmv. Thanks a lot for this excellent article! Which versions of Android does this apply to? The steps don’t apply to Android 7.0 it seems. Will have to figure out the path for that. Found it, it’s “Cellural data always active” on Android 6. Not only drains battery but eats bandwidth too. I always tell everyone irl to disable that setting. Completely pointless. The only use for it would be if you have a download going and move away from the WLAN coverage, but usually it will get stopped anyway due to IP change. And video call applications can wait a few seconds before kicking you out of the session, so no need for fast switching between WLAN and 4G/3G. Android 8.1 Oreo has the best power saver system that I have ever seen by default. The poor efficiency was with Android 6.0, my 3000mh phone was drained to the bone in few hours while using location services with maps. The Android version is too much important here, imho. Basically, it’s because your router is closer then the cell tower. The Wi-Fi radio in a phone is low power and short range, so it uses less energy then the cell radio which is much higher power for use over a far greater distance. This is true. And there’s a corollary that should be kept in mind — if your cell radio is turned on and it can’t find a tower to talk with, it increases the amount of power that the radio uses, in an attempt to contact a presumably more distant tower. So, if you’re in an area without cell coverage at all and your cell radio is turned on, you’ll see an even greater battery drain than normal. The short time i used an Android, i tapped 7 times in a row on dev build number, then You get developer settings to change as well – then You can change several settings that makes the phone faster and drain battery less as well. There are many tips about this online, listen to one that know what he/she is talking about. Today i use a a very simple mobile phone that almost only has; start, stop, call or answer as functions….old but working – and no spying either ! For me, the biggest drain on my battery were background apps. It’s amazing how many apps are running in the background. I use an app called Hibernator to close them down once in a while. I use the ‘Ultra Power Saving’ mode on my Samsung S5, which saves even more than the regular ‘Power Saving’ mode. On Ultra, you still have call, text, internet browser, and a few other simple apps of Samsung’s choosing, but you can’t install new apps in Ultra. Everything is black/gray and white, no color. It lasts 5 days between charging, while on standby and minimal calling/texting.